These tanks arrive to you complete and ready to go out of the box after a little assembly. 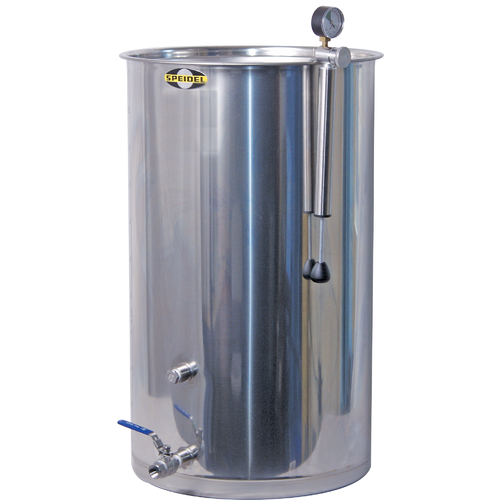 The tanks are fitted with 1/2 inch threaded ports to accomodate the included 1/2 inch stainless steel ball valve and 1/2 inch stainless plug. The plugged port is intended for use with an optional thermometer (MT514). What is the recommended Airlock for this tank? Fruit flies. I searched high and low for a replacement airlock and while you can reorder the orange cap from morewine for about $8 you will see other people havie the same issue with it breaking. There are alternative airlocks you can use. You have to search for them. Morewine doesn’t want me to show the link to them, which is understandable. There are no recommendations for any particular type of airlock to my knowledge. I use the take apart plastic type because they are easy to clean, have interchangeable parts and fit other fermenting systems. Your choice and preference. I have 4 of these tanks. I use a buon vino rubber stopper with a regular 3 piece airlock. Lance, our tank came with an airlock. Its 1.5 inches and tapers up to 1.75 inches. I’d give this manufacturer a 4.5 if this app would accommodate fractional scores. Nicer then the Italian tanks I have. I have 5 tanks in two sizes:220 L and 110 L . I love these tanks. They’re set up with ss NPT ball valves which are nice but because they’re threaded, the handles don’t always land in convenient places. 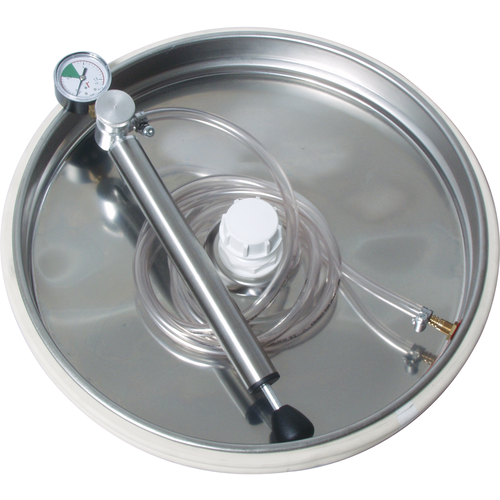 One of the 110 L lids is a little snug when fully deflated due to a slightly smaller tank diameter. Improved air tight secondary fermentation. Good quality product with excellent seal. My secondary fermentation is improved. Easy clean up. I've used the 110 liter Speidel tank for a couple of years now and zero problems. I have 25 gallons of Chardonnay in the tank in refridgeration now. 110 Liter volume is almost 29 gallons which is a good size for me. I love the thermometer attachment as temperature is very important in my wine making and my other stainless steel tanks didn't have that. It fits well into my cold stabilization freezer and is easy to clean. There were no defects on arrival. We bought this tank several months ago and currently have about 25 gallons of Vidal Blanc aging. I love the variable capacity and the fact you don’t have to “top up”. The lid is very easy to use. The tank is very well made and easy to clean. We did notice some gross lees accumulated at the top valve opening. These drained down into the wine we were transferring out of the tank via the bottom valve . Next time we will open the top valve and let some wine drain out to “wash” those Lee’s away. There will be a little waste but worth it because as we transferred some of those Lee’s got into the wine. Would love to have a second one !! This is my first stainless tank. The quality of the metal is excellent. I really dislike the plastic "airlock" piece though. It screws together and clamps around the hole in the lid. The problem is that the cap on top causes these 2 parts to unscrew if you actually get it tight enough to not leak through the cap and then try to remove the cap. Then wine starts leaking through and fills up the top of the lid. I broke the bottom threaded piece trying to get it tight enough to stop coming unthreaded. Then of course it leaked even more but I didn't realize why until I took it apart and saw it was cracked in half. It probably also doesn't help matters that the plastic airlock is the only good way to get a handle on the lid to move it around. I really wish this had some other kind of airlock mechanism, or a 1.5" TC on the top. I'd still buy it again for sure but I'm tempted to have someone weld a 1.5" TC flange on the hole in the lid. These are very high quality. I have used for racking, MLF and short term storage. The seals hold very well. Bought 2 last year and will likely buy more this year. Excellent craftsmanship. After receiving 2 Marchisio tanks from another company through Amazon I had to send them back. You wouldn't believe the flaws and poor craftsmanship. I swear they were accidentally shipped or the people making them that day were really in a bad mood...not good! A friend of mine sent me a link to MoreWine and I liked the price and look of the 110 Speidel. Just came in today. LOVE IT! It's very clean (no scratches). Great weld...almost un-noticeable, very nice lid, pump and seal. The seal is a solid white seal that I've never seen before and feels like it's going to last for a long time. This tank was actually less than the Marchisio and it's twice the tank. You will be happy with this tank!